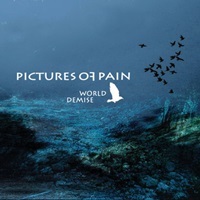 Together for over ten years, Norway’s Pictures of Pain live by a ‘wait until it’s just right’ credo for album releases. Their first album for Pitch Black The Reckoning came out in November 2010 – while the follow up World Demise before this scribe hits the streets almost 5 ½ years later. Funny how work/personal issues can eat up a lot of time – beyond the often tedious songwriting and recording process. Remembering their debut had a diverse melodic/epic metal approach, but often appeared piecemeal without fluidity in construction, fear enters when pressing play at the prospect of more of the same when taking in nine songs over the course of 75 minutes (yes folks, that’s averages out to 8 minutes and change per track). One minute into opener “Legacy”, you’ll get everything from melodic power to doom riffing, which can then springboard through to raspier epic passages and extreme screams – giving you an aural mind trip of dynamic sub-genre proportions (even at one point tackling a slower interpretation of Savatage’s “Prelude to Madness” and embellishing with Metallica-esque twin guitar harmonies). Their death/black side comes to the fore on the follow up “The Storm”, the guitar riffs and snare hits taking on elements of the sonic surge as if Primordial is going toe to toe with Death circa the early to mid-1990’s, while the lead break uses a lot of tapping and wah-wah elements to give more power against the heaviness. Musically there’s no doubt the quintet is adept at pulling out a variety of nuances when called for: clean transitions, speedier tempos, atmospheric build-ups, and surging power that can be thrash, death, progressive, black, or melodic from part to part. And yet, there’s so much information to wrap one’s head around, that Pictures of Pain can lose sight of the bigger vision to sustain a larger following: cohesion. Most people want to put a stamp on a particular band, and struggle if it appears that they straddle the lines of the underground and above ground audiences. Hans Helge Iversen as a vocalist has a 70/30 split in terms of clean to raspy delivery, and that can be a challenge to accept when his former nature has a touch of a moaning pitch control issue (think weaker Serj of System of a Down) while the latter actually sends chills in the right direction -“I Walk Alone” a great example of both elements as lead guitarist ends the songs with U2/The Edge-like dotted note fading break. World Demise probably sits best with an open-minded melodic/epic death oriented audience who doesn’t mind a lot of harmonic/melodic hooks in the guitar department and strong doom transitions. Pictures of Pain are heading in the right lane, you just wish they would keep things a touch shorter on all fronts for fuller, long-lasting appeal.